Jon Renau Heidi! These free-flowing waves fall with boho chic below the shoulder. The SmartLace hairline and monofilament cap provide multidirectional styling and look like natural growth. Wig Pro Helena! Short, curly, wavy, layered, premium quality wig by Wig Pro. Featuring a light weight open cap. Completely natural looking! Size: Average Length: Front 3.75", Sides 2.75", Nape 2.25" Weight: 1.75 oz See item details for additional colors. Please allow one week for special order colors. Premium, mid length, long, straight, Remi human hair, lace front wig! Remy hair is defined as human hair from a single donor in which, cuticles are kept intact and hairs are organized facing the same direction from root to tip. This means the hair remains softer and silkier, and is useful in producing higher-quality wigs, extensions and hair pieces. The lace front provides a completely natural looking front hairline and the hair can be swept back with the the lace front giving the illusion that the hair is growing right out of your head. The hair length is 17 inches. See item details for available colors. 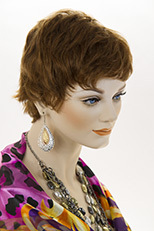 Modern, short, straight, layered, shag style wig! The weight of the wig is 3 oz. The bangs are 5 inches, nape is 7 inches, top is 4.5 inches and the sides are 5 inches in length. Available in natural looking shades of blonde, red and brunette. See item details for available colors. A playfully textured bob with soft, face-framing layers, this SmartLace style mimics natural growth with a lace front hairline and monofilament top and crown. Casually sideswept bangs and long, wavy layers embody easygoing aplomb in this SmartLace style, enhanced by a natural looking lace front and comfortable open cap. Mustache 3 point, hand tied. See item details for available colors. 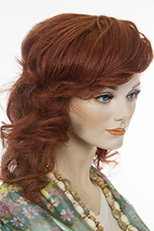 Striking mid length wavy wig, which has hair, falling past the shoulder, 17 inches in length. Featuring a natural looking skin top, which is 4x4 inches in size. See item details for available colors. 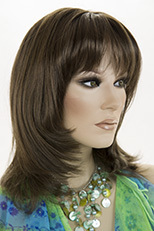 Featuring premium human hair and a skin top, this lovely wig is 18 inches in length. It has a slight wave and is lightly layered. 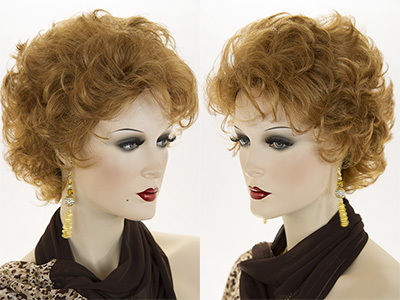 This lovely wig can be styled wavy, curly or straight. See item detail for available colors. 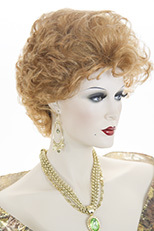 Sophisticated short, wavy, layered style wig, with a petite size cap. Approximate weight is 2 oz. See item details for available colors. 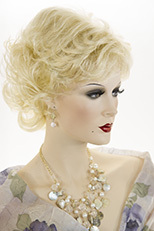 Stunning short, curly, wavy wig with a monofilament front and completely hand tied. This wig is in a size petite only. Perfect for someone with a small head. See item detail for available colors. Luxurious Remy hair! Long, straight, partial monofilament top, premium quality, Remy human hair wig with bangs. Remy hair is defined as human hair from a single donor in which, cuticles are kept intact and hairs are organized facing the same direction from root to tip. This means the hair remains softer and silkier, and is useful in producing higher-quality wigs, extensions and hair pieces. Remy hair is less likely to tangle as the cuticle is in tact. Hair length is approximately 24 to 28 inches. Bangs are approximately 6 to 8 inches. The partial monofilament top is approximately a 1 inch circular area at the crown. See item details for available colors.